Generously scaled cocktail table with inset glass top. Solid wood construction with bull nose frame in black lacquer, all surfaces faced with custom designed hand crafted acid etched panels by Bernhard Rohne. As designer of nearly all of the Mastercraft offering prior to selling his company to Baker, Bill was known for his creative use of brass. In at least some form, he included brass on nearly every piece of Mastercraft made until that time. In the case of this table series, Bill collaborated with his long time supplier, German artist Bernhard Rohne. A Note on Mastercraft Attribution. 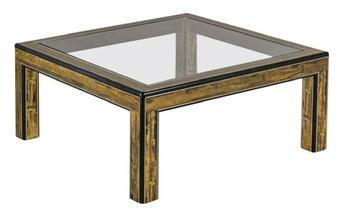 This table series, and many other Mastercraft pieces, is often attributed as designed by Berhard Rohne. There is no question that for many years Rohne’s contribution to the Mastercraft offering was immense. But the primary design attribution should be William Dozema. I had the good fortune of working with Bill in Grand Rapids in the mid-1980’s, and to work in the factory where these tables were produced. Bill and his brother founded Mastercraft after the War, and turned it into a very successful designer focused operation. The company eventually acquired a foundry outside of Chicago, allowing production of the intricate brass castings Bill so often used on Mastercraft designs. This included both structural components, but perhaps even more well known today, exceptional original hardware. A key Mastercraft advantage became the ability to do very short foundry runs. Rohne provided two dimensional panels for countless Mastercraft designs, and this note in no way diminishes the enormous contribution Rohne made to Mastercraft designs. He continues his artistry today in western Canada.